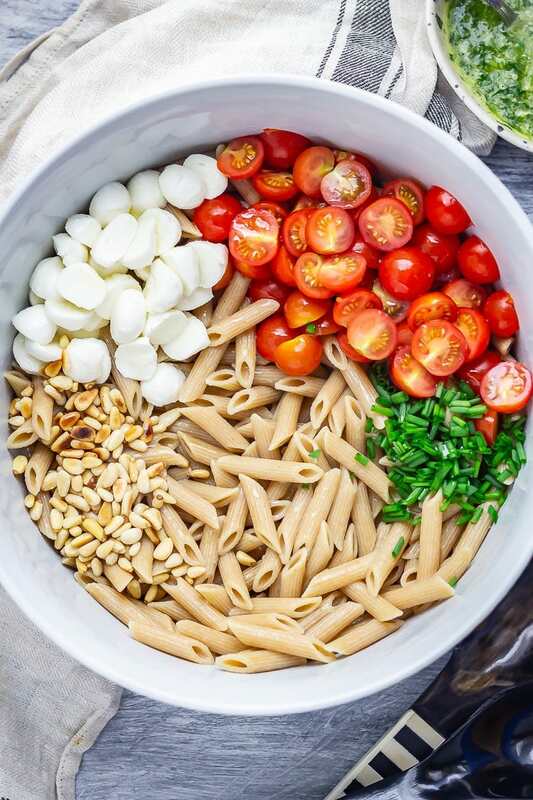 This caprese pasta salad has all the classic flavours of an Italian caprese salad but with the addition of pasta and pine nuts. It’s the perfect summer dish. I am declaring this the summer of pasta salads. 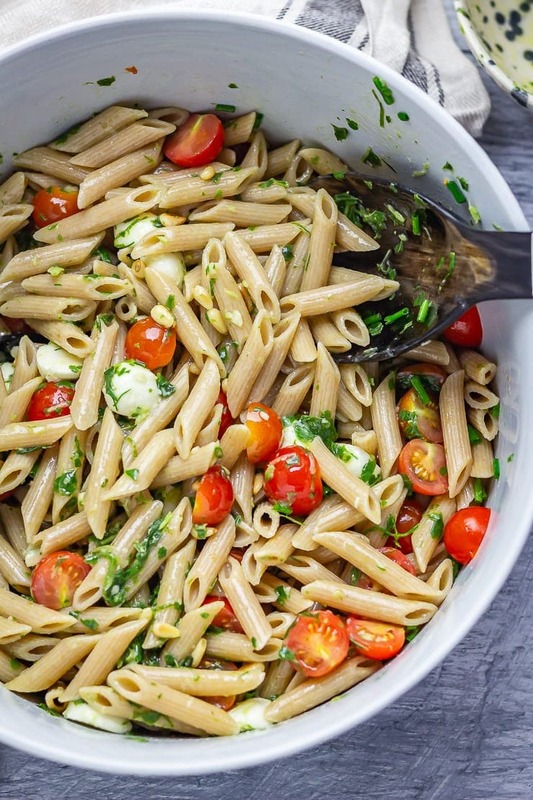 I’ve always loved a good pasta salad but this summer it’s all I can think about eating. 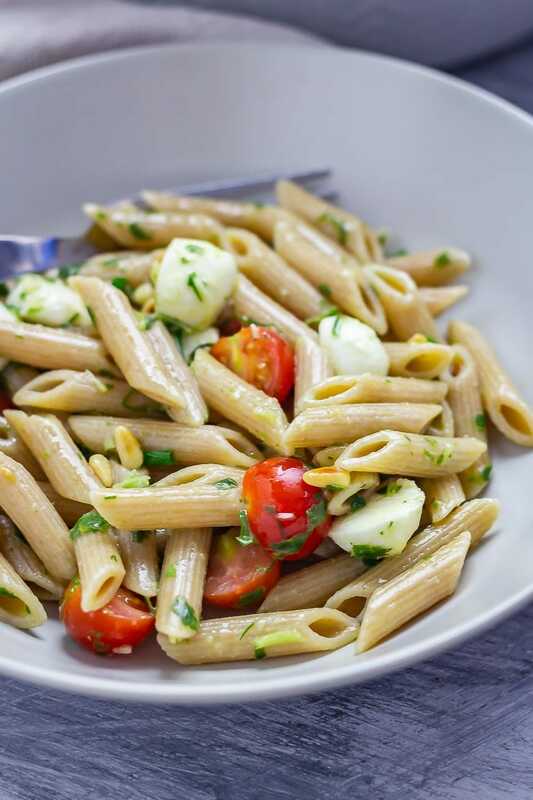 I’ve made a simple pasta salad with balsamic, Greek orzo salad with lemon dressing and now I’ve taken a classic caprese salad and turned it into possibly my favourite pasta salad yet. I am loving summer this year. We actually seem to be having pretty good weather and I’ve got everything crossed that it continues. Especially because I have loads more summer outfits that I haven’t had chance to wear yet. I absolutely LOVE my summer wardrobe. 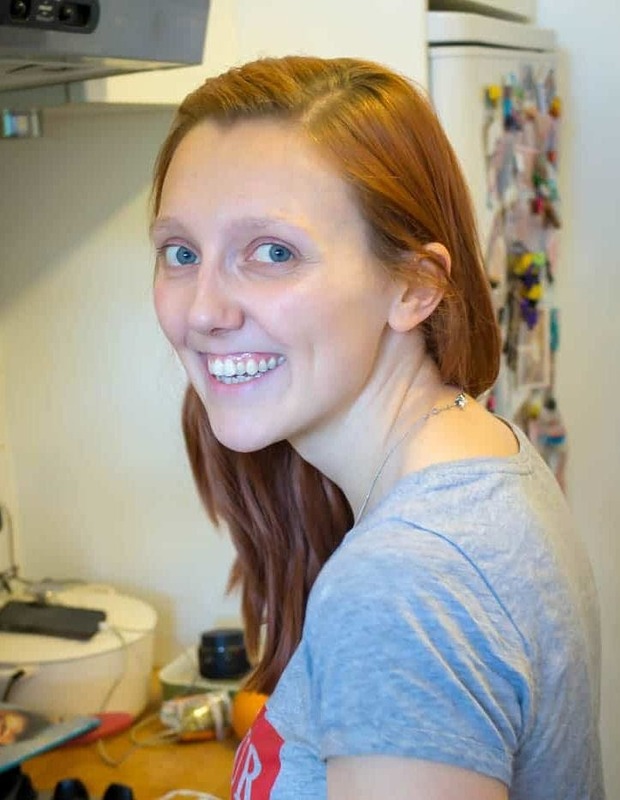 I’m not super into clothes, mainly because I’ve never had much money to spend on them, but on the whole I love wearing summer clothes so much more and all my summer clothes make me feel much happier and better about how I look. The second thing I’m loving about summer is all the summer food. Every year I fall in love with summer food all over again. This year I’ve decided I’m all about the bbq side dishes and picnic food. 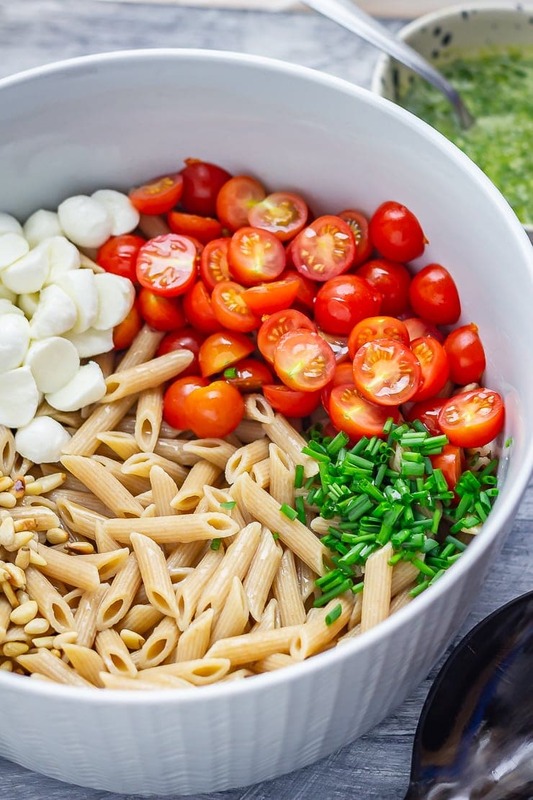 Pasta salads are my number one outdoor eat and I’ve decided that this year I’m going to expand my repertoire of them so that I’ve got something to take to every bbq and picnic I attend. When we were in Italy we were perpetually hunting out a good caprese salad. Before Italy I don’t think I’d ever had a truly good tomato but then I tasted those beautiful summer tomatoes with that fresh mozzarella and my life was changed forever. Now I know that tomatoes are one of the few things that I deem it worth splashing out on to make sure you get some flavour in those bad boys. Anyway, back to Italy. We obviously had some incredible caprese salads while we were in Italy but the one that sticks out in my mind was actually the worst one we had. We were in Rome and it was boiling hot, we’d spent the day traipsing around, sightseeing, and I was getting pretty hangry. We were trying to find somewhere to eat and ended up settling on a miserable tourist trap where we had a caprese salad made up of bland mozzarella, watery tomatoes and a few tiny basil leaves. Having tasted how bad a caprese can be I know when I’m eating a really really good one. 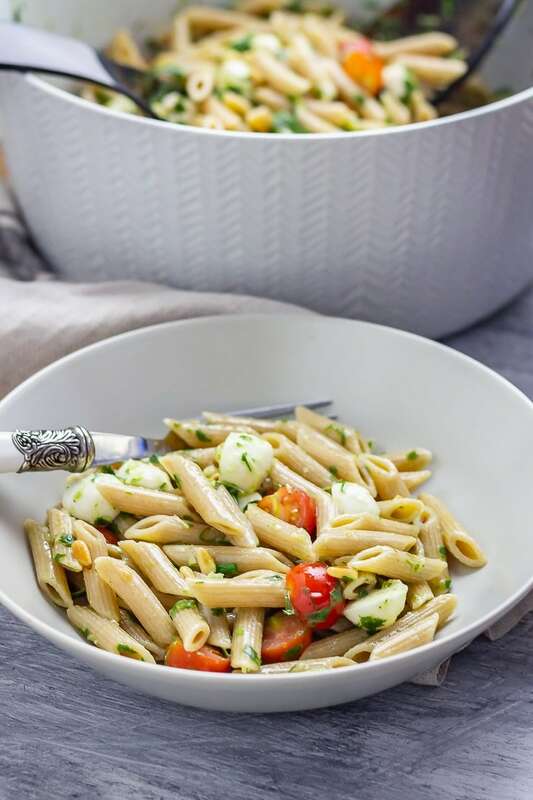 And as much as I love a classic caprese salad this caprese pasta salad is really really good AND steps up on the carbs which can only ever be a good thing. 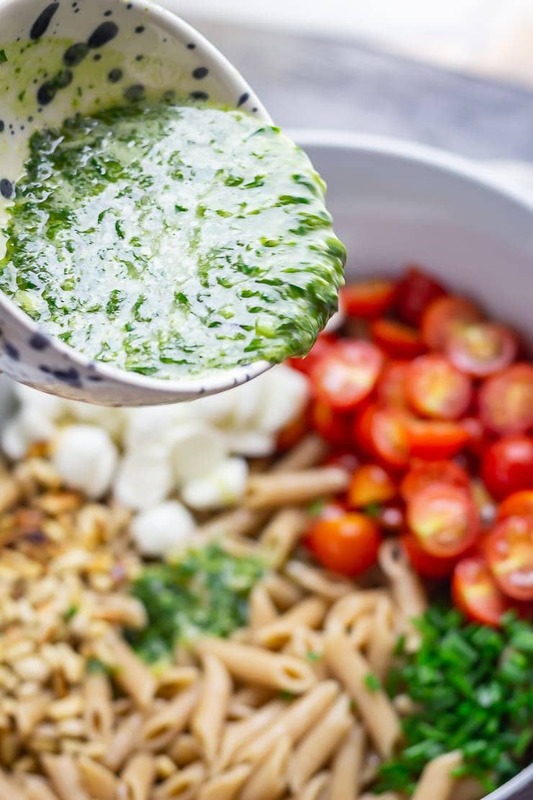 Instead of sticking with straight basil leaves I decided to coat the pasta salad in an amazing basil dressing which gives that caprese flavour in every bite. Want more? 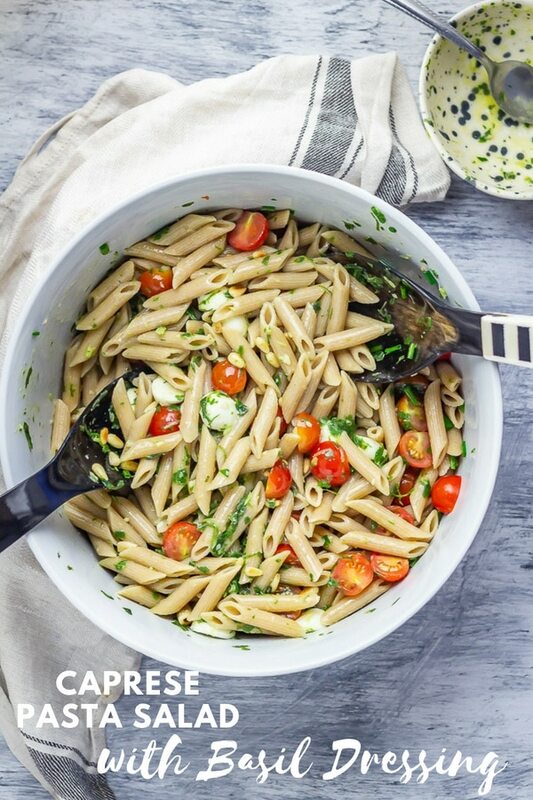 Get all my other pasta recipes before you go! 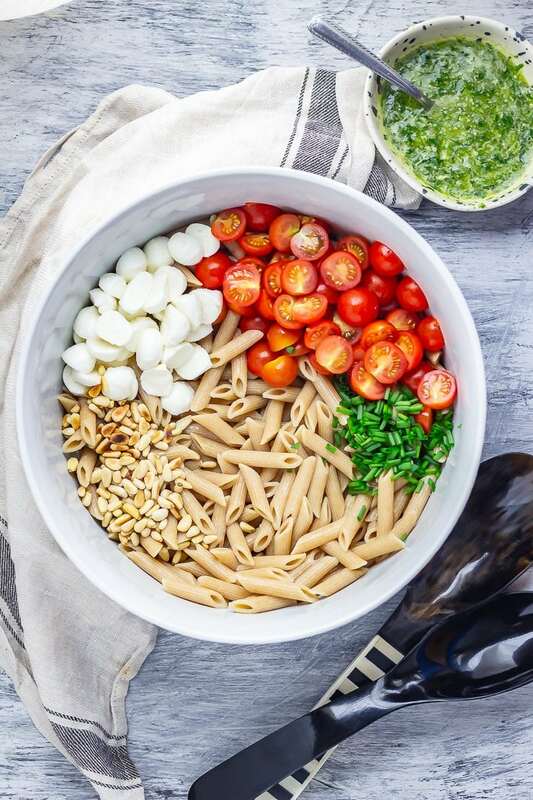 WONDERING WHAT TO DO WITH THE LEFTOVER INGREDIENTS YOU’VE GOT ONCE YOU’VE MADE THIS CAPRESE PASTA SALAD RECIPE? 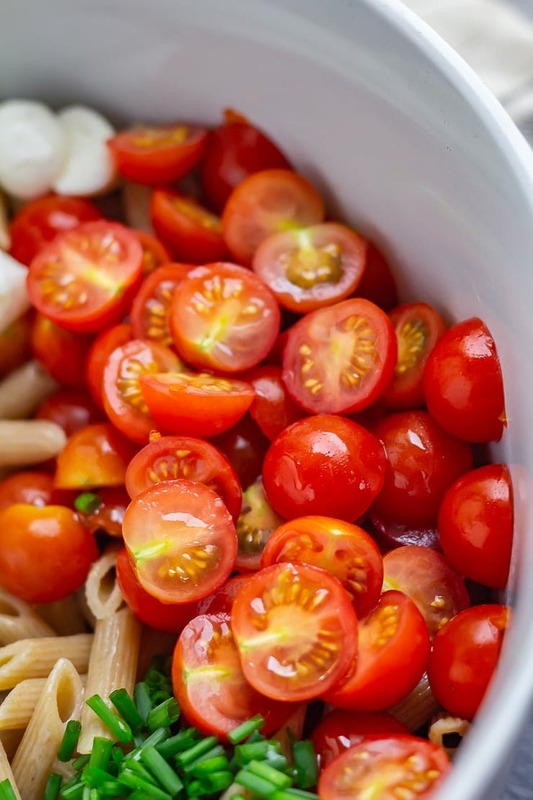 Use up some of these beautiful cherry tomatoes in this easy barley recipe. 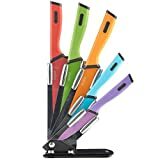 Got basil to use up? 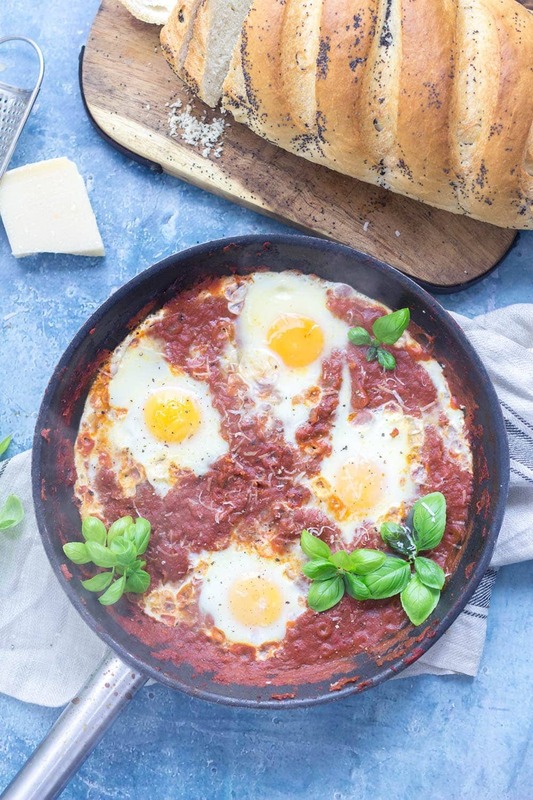 Then make sure it makes its way into this Italian version of a shakshuka! 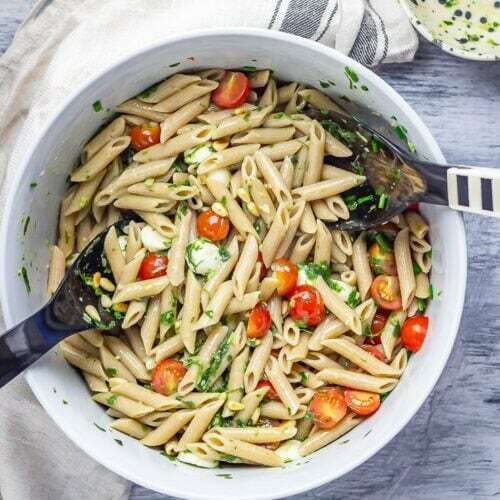 Cook the pasta according to package instructions, drain and drizzle with a little olive oil in a large bowl. Alternatively you could use leftover cooked pasta. 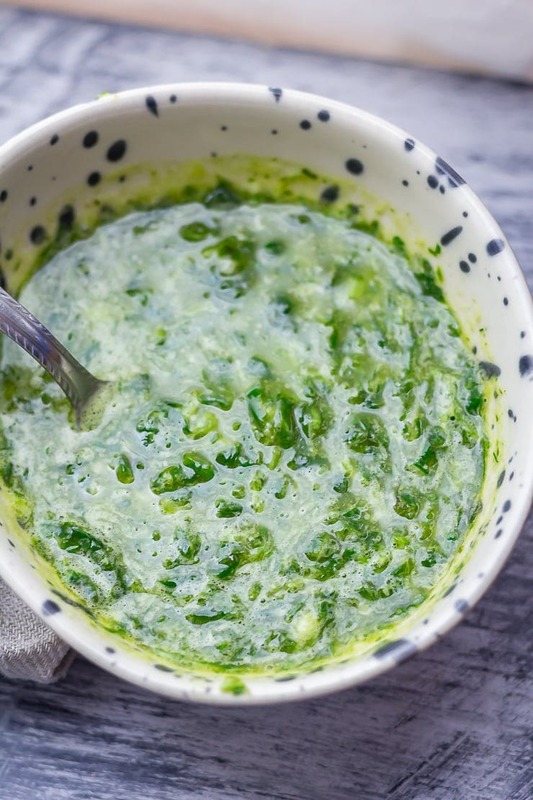 Place all the dressing ingredients in a blend and blitz until you reach your desired consistency. 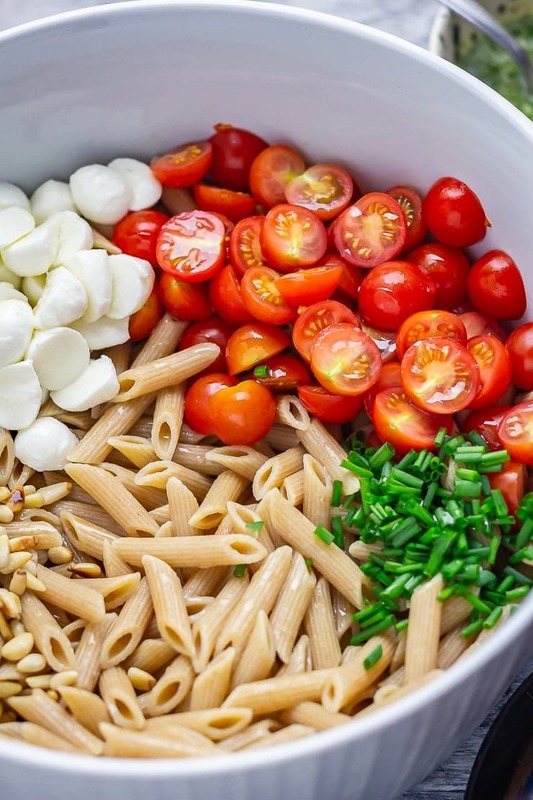 Add the mozzarella, tomatoes, pine nuts and a sprinkling of chopped chives to the pasta. Pour over the dressing and toss everything together thoroughly. Serve. 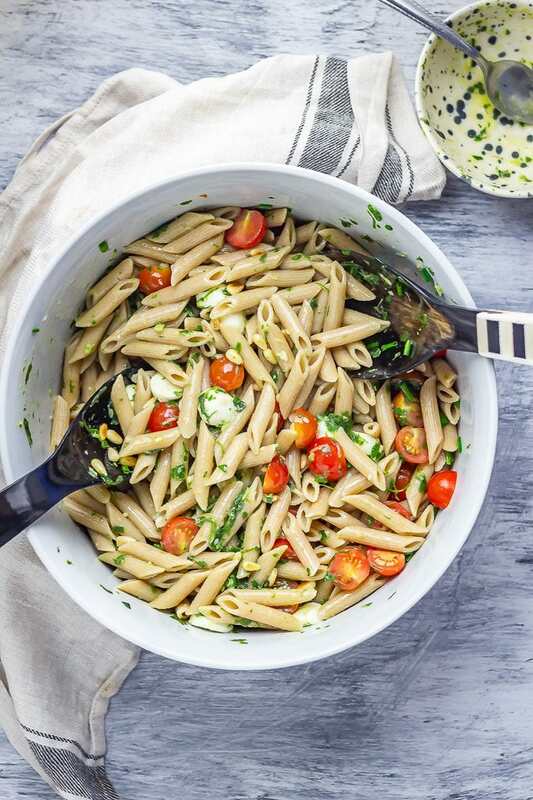 I love this kind of pasta salad, so easy to pull together and yet it tastes amazing! Fresh and light and so perfect for hot days. 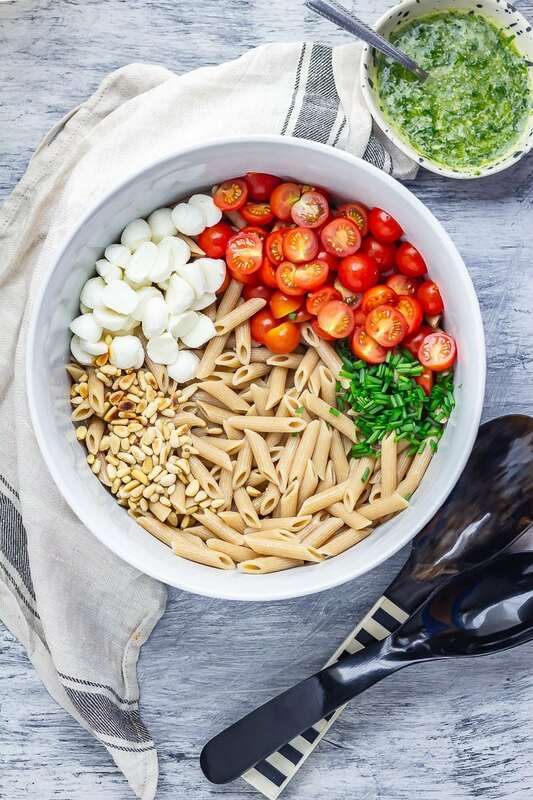 What a beautiful looking pasta salad – one of those dishes that looks effortlessly simple but is actually packed with different textures, flavours and colours. Yum! This salad looks so tasty! 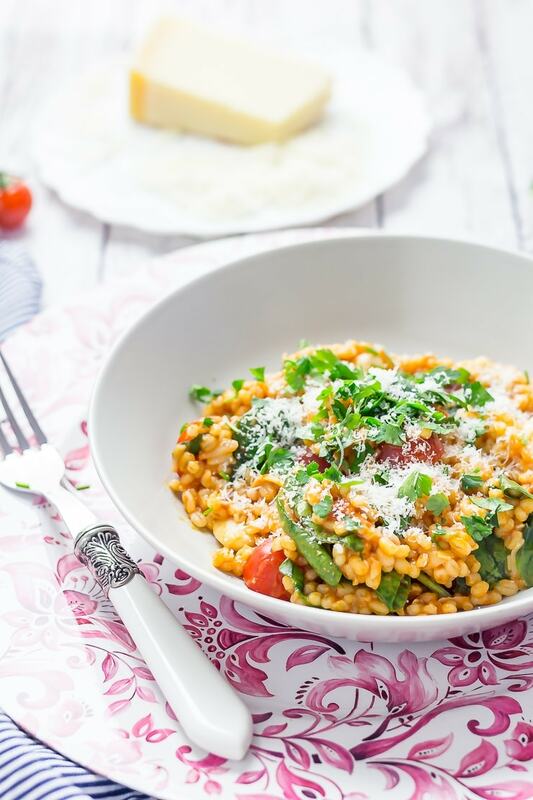 A lovely summery way to enjoy Italian flavours. This beauty of a dish looks so bright and fresh. I could just dig right in! !